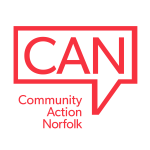 West Norfolk Voluntary and Community Action (WNVCA) was formed in 2002 working across Western Norfolk including the towns of Hunstanton, King’s Lynn, Downham Market and Swaffham. For 22 years prior to that, an organisation had existed which predominantly focused on providing a volunteer bureau service. The new ‘Council for Voluntary Service’ would continue with that work but its primary aim was to provide support to the sector in the five core functions of development, representation, liaison, strategic partnerships and support. WNVCA was based in Tuesday Market Place, King’s Lynn for many years but in 2011 it moved to a refurbished building on the North Lynn Industrial Estate where more services could be delivered in-house. Staff numbers have varied from five to fifteen depending on the projects being delivered and funding available but always with Heather Farley as Chief Executive. In 2014, with an eye on the financial challenges of the future and the difficulty funding support and development services going forward, merger options were explored. Positive conversations took place with Norfolk Rural Community Council which led to the formation of a new, merged organisation in April 2015.